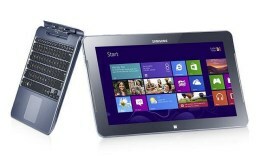 ATIV Smart PC is the ultimate hybrid companion that brings a PC-like experience on an ultra portative construction. ybrid devices are my favorite technology market segment as they always offer interesting and innovative solutions. What I am going to reveal for you in this video review incorporates the flexibility of a media tablet with the ease-of-use of a notebook PC. This is the revolutionary third member in Samsung’s ATIV family – the ATIV smart PC. Our smart PC came in what Samsung calls Mystic Blue color but it’s also available in the classy white color. The polycarbonate case stands out with the blushed glossy finish that perfectly corresponds to the device’s elegant design. The slim dimensions and the weight of only 1.4kg contribute to the compactness of this hybrid. This unique device is easily converts from a laptop computer into a tablet with just a single press of the docking button. As you see it’s pretty easy to detach the display, meaning the tablet, from the keyboard docking station. This is the reason why it’s called ATIV smart PC. The 11.6’’ HD PLS display allows you to take full advantage of the brand new Windows 8 platform. It supports multi-touch technology that responds to finger gestures of up to 10 fingers, which, of course, we give it credit for. For better control Samsung have provided an S-Pen stylus. The tab sliding menu provides one-touch access to all the applications loaded on this machine, but for more PC-like experience you can always easily switch to the desktop mode. If you like you can upgrade to the Windows 8 Pro version of the platform. The graphics are provided by Intel Graphics Media Accelerator. This new-generation hybrid features a dual-core Intel Atom Processor at 1.5GHz working frequency with a Burst up to 1.8GHz. The RAM on board is 2GB. With this highly portable device you can be always connected through Wi-Fi, or the wireless 3G, 4G and LTE. The ATIV smart Pc comes with 64GB of storage and an option for further expansion thanks to the microSD card slot. Since this tablet/notebook is meant to always be there for you, no matter where you are, it provides the communication technology needed to always stay in touch with your friends and family. The chassis features a rear-facing 8MP camera facilitated by an LED flash. And also a 2MP front camera that provides excellent video-call experience. It is also ensured by the 31Wh battery that gives this hybrid a pretty long battery life – 9 and a half hours of DVD play. The connection capabilities of this smart PC by Samsung also include Bluetooth v4.0, 1 USB v2.0 and 2 more keyboard USB ports. There is also a microHDMI port. The speakers are two and are placed along the display on both sides. The sound is a pleasant surprise as the speakers are not only surprisingly powerful but provide a pretty good sound quality as well. The interactive touch-keyboard is responsive and the keys provide are big enough to ensure typing comfort but it you are not a fan of touch-screen texting you are going to just love the actual keyboard, it’s compact but the keys will not be a challenge for people with big hands. The keys have rounded corners and their short stroke provides immediate response. The touchpad is placed below the keyboard and the two auxiliary buttons are integrated in its surface.